When the trick carp rig has been tied together it's ready to be loaded into the PVA bag and set for casting. 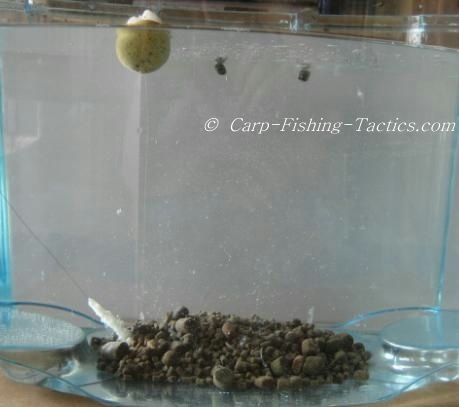 Gently place the hook bait into the PVA bag first and drop in a few pellets. Then gently place the lead into the bag making sure all line is free from any potential tangle. Try to keep the lead towards the top end of the bag like shown in the picture above. The main line and the boom swivel should be inside the bag only the line from the boom will exit the bag. While the bag remains on the table, gently load the bag with pellets using a funnel, I use the tube from my PVA stick system. Lift the top part of the bag to open and place the funnel inside. Then load a handful at a time and after each one shuffle the pellets down into the other end of the bag. This way you can gradually load the bag while the lead stays towards the top end. Now tie the top end of the PVA bag together by twisting the excess around the main line. Moisten it a little and twist until it sticks, I usually then tie this end with some PVA tape just to make sure it holds during the cast. However, be aware that doing this will mean this end will take much longer to melt when in the water. 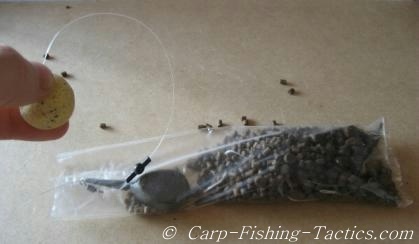 Grab the pop up boom and hold it against the bag then tie more PVA tape around the bag about two-thirds of the way down. This is done to hold the boom away from the main line. Without this tape the boom will just fly up and tangle around the main line on casting. 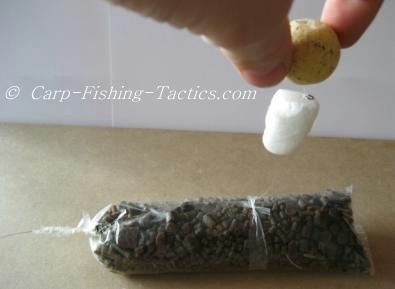 Also, secure some PVA nuggets to the boom near the pop up in order to create maximum buoyancy. This is needed so the whole set up will turn the right way up when it hits the water. If it hits upside down and falls trapping the boom then it wont lie properly on the bottom and the pop up will be too close to the pellets, this may spook the carp a little too much - you need distance between the lead and the pop up! Having the lead weight against the underside of the bag or the opposite side to the side where the pop up comes out will help the rig to fall the right way up. The lead weight and the buoyancy of the pop up will cause it to turn. This is another reason why I fill the bag on a flat surface and not lift the bag up to fill it. The picture above shows a completed trick rig ready for casting. I have also found that after the rig hits the water pulling back slowly helps it to sit well on the bottom and gives good bite detection. Here is a picture of the trick rig after it was dropped into a glass tank. The trick rig was designed with carp safety in mind. If a carp breaks the main line then the pop up will fall off the end, the lead will also pop off under a little tension. This means the carp wont have to drag a huge pop up around if he escapes the fight. Because there is no tubing used you will need to be careful when playing a fish, too much tension or bullying a fish into the bank may cause the line to flick under a carps scales. I usually let the fish go when it wants to, thus I prefer to use the trick carp rig in open water with little snags or weed beds.